HÀ NỘI — The Investigation Police Department on Drug-Related Crimes under the Ministry of Public Security has issued an urgent arrest warrant for the leader of a huge trans-national drug ring connected with 300kg of drugs recently seized by police. The wanted man is a Chinese national named Wu He Shan, 56. The police said Wu He Shan and his accomplices – Huang Zai Wen (from China), Thào A Dơ, Thào A Páo and Lý A Vừ, residents of Điện Biên Province – brought drugs into Việt Nam and then transported them to another country. Legal proceedings have been launched against the four accomplices for the illegal trading and transport of drugs. 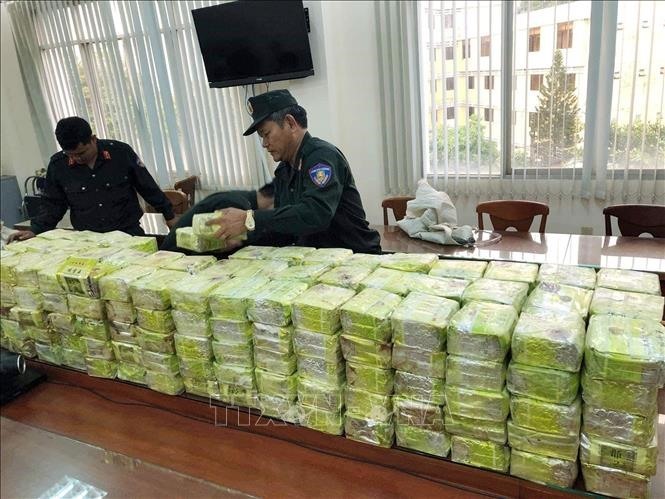 On March 20, Thào A Dơ, Thào A Páo, and Lý A Vừ were caught red-handed transferring more than 300kg of drugs to Huang Zai Wen at Hashan Company, located in Bình Tân Ward of HCM City. The three had transported the drugs by truck from Bờ Y border gate in the Central Highlands province of Kon Tum to HCM City. After expanding their investigation, the local force worked with police in the Philippines to seize an additional 276kg of drugs on March 23 in latter nation. The drugs were sent by Hashan Company and declared as PP plastic granules. The consignment left Cát Lái Port on March 13 and reached North Manila Port on March 19. Informed by the Vietnamese police, the Philippine side was able to seize the drugs. On Wednesday, border guards in the central province of Quảng Bình captured four Lao men carrying 110,000 meth drug tablets across the border into Việt Nam. They also seized three cars, 19 million Lao kip (US$2,200) and weapons, Tiền Phong (Vanguard) newspaper reported. The men fiercely resisted when they were arrested in Laos’ Khammuane Province. A soldier was seriously injured while trying to arrest the traffickers. He is still being treated in hospital. This is the largest transnational drug ring ever that has busted by Vietnamese and Lao forces.